Real-time tracking, across any device you own! Developed and manufactured in the USA by LandAirSea, a leader in consumer and enterprise GPS tracking gear since 1994, The 54 allows you to track your loved ones and valuables when you can't be around. Whether it's your child coming home from school, a loving spouse, a teenage driver, or valuable company assets, The 54, with cutting-edge GPS technology, keeps you up to date in real time. This state-of-the-art tracking device is compact, completely waterproof, and about the size of a small roll of scotch tape. It has an extremely powerful internal magnet for easy placement and is powered by a rechargeable lithium polymer battery that can last a week on average (depends on usage habits and tracking update frequency). To enhance battery life and tracking accuracy, the 54 features a built-in accelerometer that detects motion and powers the device on or off depending on whether the tracker is moving. So the battery won’t die at an inconvenient time. Multiple tracking plans are available depending on your needs with tracking updates ranging from 3 seconds to 1 minute. 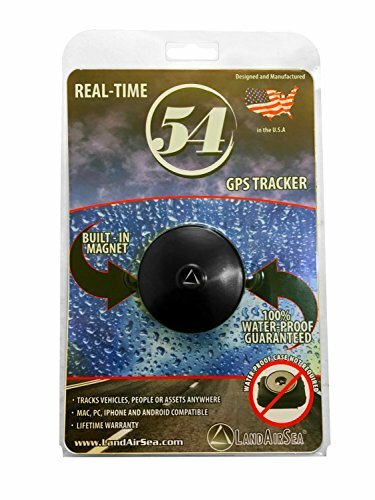 The innovative LandAirSea 54 portable real-time GPS tracker has the features you need to keep your loved ones safe and yourself informed, all at an unbeatable price! If you have any questions about this product by LandAirSea, contact us by completing and submitting the form below. If you are looking for a specif part number, please include it with your message.